I have lived in Thailand for quite a few years now and I can honestly say that it is one of my favorite countries on Earth. I am based in Bangkok but love to travel throughout the country with regularity, one of my favorite places to go in Thailand is Phuket, craziness, culture and beauty all rolled into one and whenever I get a weekend free, I check out the Phuket villa rentals to see what is available and try to spend a few nights on this beautiful island. Phuket is an island that in all honesty feels like a country all on its own such is its size and it is a real blend of styles, influences and cultures. Back in the day when I started going to Phuket, it was a back packer’s paradise, then it went through a stage of being the playground of the rich, these days however, the island hovers somewhere between the two and as such, there is something to do for a wide variety of tourists. If you are planing on a trip to Phuket then here are some of the things that I recommend that you do. This huge statue is not one of the World’s seven wonders but it really should be, a 45 meter bronze statue, plated with limestone that overlooks the whole south of Phuket. Not only is the Buddha statue a magnificent sight to go and visit but from the peak were he sits you can get some of the most outstanding views across the island and to the ocean. This is one of the most important temples in Phuket and in my opinion, one of the most beautiful. Living in Thailand you get a little spoiled when it comes to temples but this one reinvigorated my love for the religious buildings. The intricate glasswork detail on the many pagodas on the temple will absolutely blow you away. Whether you are a party hunter or a culture vulture, you simply have to witness Patong on an evening. Patong will scare you, shock you, make you laugh and provide you with one of the greatest nights of your life. The pubs, bars and clubs here are all themed differently, the music blasts, the party spills out on to the beach and there is very little left to the imagination on a night out here. There is no age limit here either, young or old, gay or straight, this is one of the craziest places for a night out in the World. Old Phuket Town is a really cool place to hang out, especially if you’ve gone big in Patong the night before and here you will be able to get a little glimpse into the colonial past of the island. The old town is where you will see a wide mixture of Chinese and European influences which have affected Phuket over the years, the mazy streets are filled with hippy-type cafes and trendy restaurants and it gives you a look at an altogether different side to the island. It’s weird, I am not a boxing or MMA fan, I don’t really like fighting at all but I have a real love for going to stadiums to watch Muay Thai battles. This martial art is built around respect for your opponent and I think that it is this which makes me enjoy it so much. In Phuket there are some of the best fights and I would recommend that you go to the stadium on a Friday or Saturday night and join the locals in cheering on your favorite fighter. 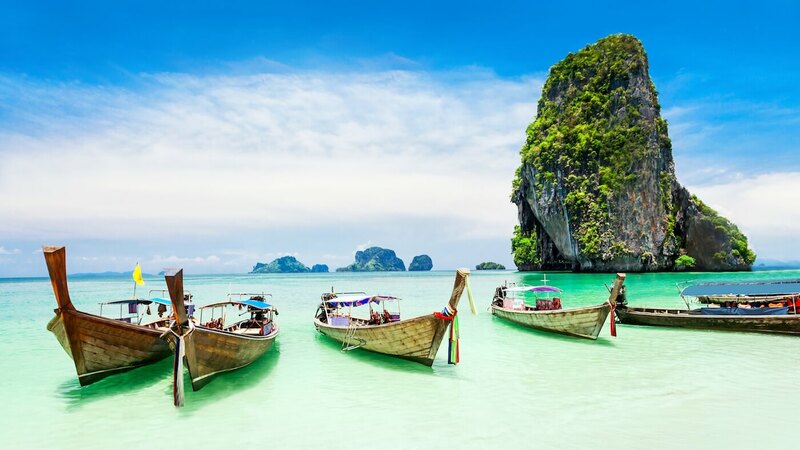 If you do nothing else during your time in Phuket then make sure that you get a night or two in Phi Phi island, the place that in my opinion, steals the crown of most beautiful place in the World. I have visited the Seychelles, Caribbean islands and many other places in the World considered as ‘paradise-like’ and I can honestly say that none of them can even hold a torch to Phi Phi. Emerald green waters, jagged rock faces jutting out over the ocean, beaches which will make you feel as though you have just discovered them and a level of tranquility which I have never felt anywhere in the World. When you go to Phuket, whatever you do, get booked up for a trip to Phi Phi island. Despite the fact that Phuket is becoming more an more popular, don’t let this become a reason for avoiding it. There are of course, some times during peak season when the island is crammed but if you can head to Phuket during the off season then you will find plenty of space and still enough madness for you to have an outstanding time.